The Battle of Hastings was part of the invasions of England that followed the death of King Edward the Confessor in 1066. 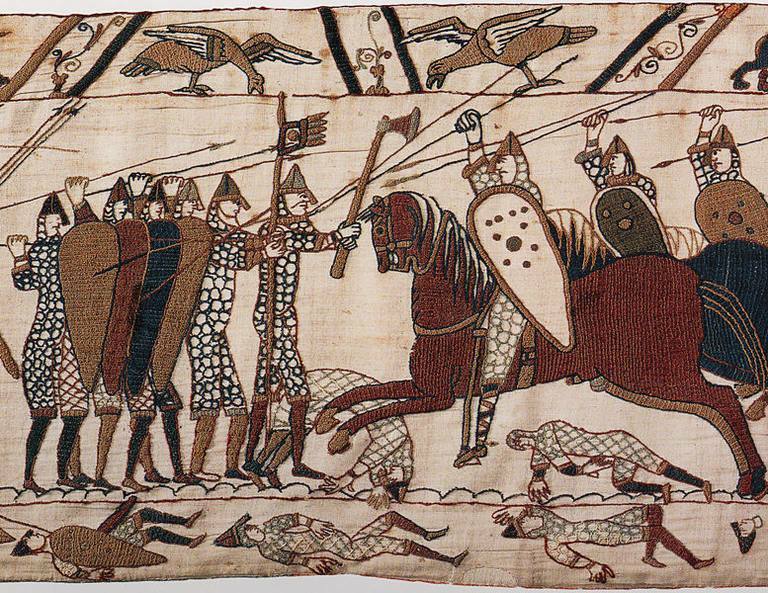 William of Normandy's victory at Hastings occurred on October 14, 1066. With the death of King Edward the Confessor in early 1066, the throne of England fell into dispute with multiple individuals stepping forward as claimants. Shortly after Edward's death, the English nobles presented the crown to Harold Godwinson, a powerful local lord. Accepting, he was crowned as King Harold II. His ascension to the throne was immediately challenged by William of Normandy and Harold Hardrada of Norway who felt they had superior claims. Both began assembling armies and fleets with the goal of supplanting Harold. Gathering his men at Saint-Valery-sur-Somme, William initially hoped to cross the Channel in mid-August. Due to foul weather, his departure was delayed and Hardrada arrived in England first. Landing in the north, he won an initial victory at Gate Fulford on September 20, 1066, but was defeated and killed by Harold at the Battle of Stamford Bridge five days later. While Harold and his army were recovering from the battle, William landed at Pevensey on September 28. Establishing a base near Hastings, his men constructed a wooden palisade and commenced raiding the countryside. To counter this, Harold raced south with his battered army, arriving on October 13. William and Harold were familiar with each other as they had fought together in France and some sources, such as the Bayeux Tapestry, suggest that the English lord had sworn an oath to support the Norman duke's claim to Edward's throne while in his service. Deploying his army, which was largely composed of infantry, Harold assumed a position along Senlac Hill astride the Hastings-London road. In this location, his flanks were protected by woods and streams with some marshy ground to their front right. With the army in line along the top of the ridge, the Saxons formed a shield wall and waited for the Normans to arrive. Moving north from Hastings, William's army appeared on the battlefield on the morning of Saturday October 14. Arraying his army into three "battles," composed of infantry, archers, and crossbowmen, William moved to attack the English. The center battle consisted of Normans under William's direct control while the troops to his left were largely Bretons led by Alan Rufus. The right battle was made up of French soldiers and was commanded by William FitzOsbern and Count Eustace of Boulogne. William's initial plan called for his archers to weaken Harold's forces with arrows, then for infantry and cavalry assaults to break through the enemy line (Map). This plan began to fail from the outset as the archers were unable to inflict damage due to the Saxon's high position on the ridge and the protection offered by the shield wall. They were further hampered by a shortage of arrows as the English lacked archers. As a result, there were no arrows to gather and reuse. Ordering his infantry forward, William soon saw it pelted with spears and other projectiles which inflicted heavy casualties. Faltering, the infantry withdrew and the Norman cavalry moved in to attack. This too was beaten back with the horses having difficulty climbing the steep ridge. As his attack was failing, William's left battle, composed primarily of Bretons, broke and fled back down the ridge. It was pursued by many of the English, who had left the safety of the shield wall to continue the killing. Seeing an advantage, William rallied his cavalry and cut down the counterattacking English. Though the English rallied on a small hillock, they were ultimately overwhelmed. As the day progressed, William continued his attacks, possibly feigning several retreats, as his men slowly wore down the English. Late in the day, some sources indicate that William altered his tactics and ordered his archers to shoot at a higher angle so that their arrows fell on those behind the shield wall. This proved lethal for Harold's forces and his men began to fall. Legend states that he was hit in the eye with an arrow and killed. With the English taking casualties, William ordered an assault which finally broke through the shield wall. If Harold was not struck by an arrow, he died during this attack. With their line broken and king dead, the many of the English fled with only Harold's personal bodyguard fighting on until the end. In the Battle of Hastings it is believed that William lost approximately 2,000 men, while the English suffered around 4,000. Among the English dead was King Harold as well as his brothers Gyrth and Leofwine. Though the Normans were defeated in the Malfosse immediately after the Battle of Hastings, the English did not meet them again in a major battle. After pausing two weeks at Hastings to recover and wait for the English nobles to come and submit to him, William began marching north towards London. After enduring a dysentery outbreak, he was reinforced and closed on the capital. As he approached London, the English nobles came and submitted to William, crowning him king on Christmas Day 1066. William's invasion marks the last time that Britain was conquered by an outside force and earned him the nickname "the Conqueror."